Eat Your City: Spinelli's Bar Italia West End location Edmonton, AB - best thin crust pizza in Edmonton! Spinelli's Bar Italia West End location Edmonton, AB - best thin crust pizza in Edmonton! Posted by Its not often we label things as "best" in the city as we haven't (and physically won't) try every single place in the city... unless they're exceptionally good. And the thin crust pizza made by the pizza maestro Rocco Papallo at the West End Spinelli's Bar Italia is one of those exceptionally tasty exceptions!! 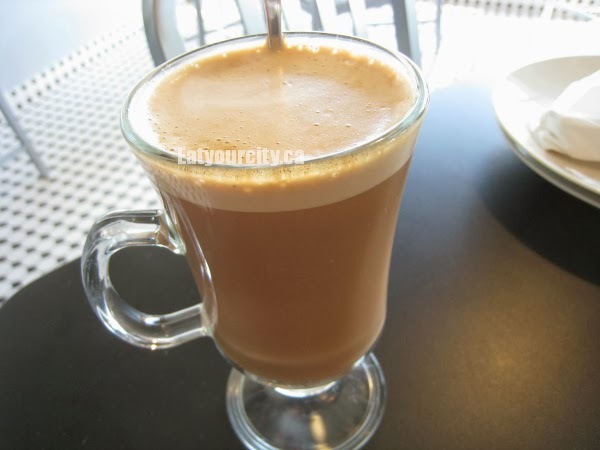 Like the Little Italy location and the South side location, Spinelli's Bar Italia is the little cafe attached to the main Italian Centre grocery store. Unlike the others, the west end location boasts some shiny new stainless steel clad fancy pizza ovens that make these tasty thin crust wonders. Customers can purchase uncooked pizza dough on Fridays if they want to give pizza making a whirl at home. And with the choices at the Italian Centre's deli, the possibilities are endless! We came on separate days and combined the pictures as the pizzas are huge and will feed two (if you have dessert) or one hungry person. Service is cafeteria like, with the pizzas and drinks delivered to your table. You can get almost any imported drink they sell chilled. I went with a delectable mocachino with almost fruity notes coming off the espresso. Nom! Another time, I had a chai latte - steeped teabag included. Its super loaded up with soft baked apples.. mmm! The Portuguese tart is a traditional favorite. Sadly, we were late, so they weren't hot and fresh out of the oven, but tasty none the less. We ordered the Margarita pizza as its a classic with only fresh basil, mozzarella and tomato sauce. Its tricky to pull off a good one, because the ingredients have to be top notch, and really, with dough and 3 ingredients, there's not a lot of wiggle room for error. Didn't need to worry, as hey, the ingredients are sourced from the Italian Centre themselves! Oh mamma.. this is a little slice of heaven! 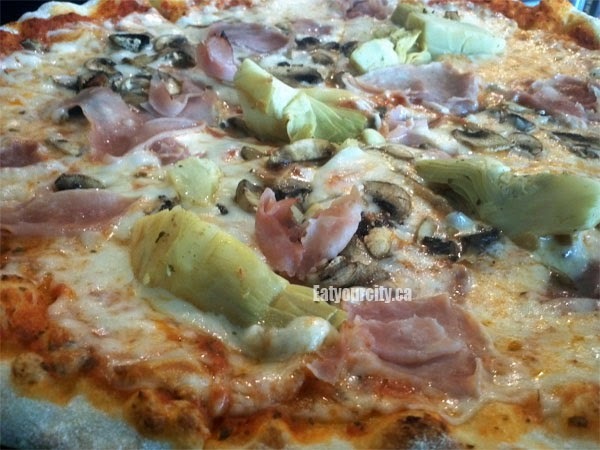 We've also tried the Capricciosa - prosciutto, pickled artichokes and mushrooms... a powerhouse of flavor. Nomnomnom! If you're craving the best thin crust traditional pizza in Edmonton... only the West End location of Spinelli's Bar Italia will do!